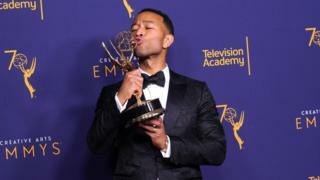 John Legend has made history by becoming the first black man to reach EGOT status after his Emmy win on Sunday night. The 39-year old has joined the select group of people to win an Emmy, Grammy, Oscar and a Tony - considered the holy grail of performance awards. The Emmy win for Jesus Christ Superstar also saw Lord Andrew Lloyd Webber and Sir Tim Rice reach EGOT status. Legend turns 40 in December, meaning Lopez is still the youngest winner. "Before tonight, only 12 people had won an Emmy, Grammy, Oscar and Tony in competitive categories," Legend wrote on Instagram. "Sirs Andrew Lloyd Webber, Tim Rice and I joined that group when we won an Emmy for our production of their legendary show Jesus Christ Superstar. So happy to be part of this team. So honoured they trusted me to play Jesus Christ. So amazed to be in such rarefied air." Legend, Webber and Rice won their Emmy for producing Jesus Christ Superstar Live in Concert, which was awarded the best variety special winner at Sunday night's Creative Arts Emmy Awards. This is the first time that more than two people have achieved an EGOT in a single year. Benj Pasek and Justin Paul were also in the running for achieving EGOT status on Sunday, but lost their Emmy category for original song for the the TV version of "A Christmas Story."